Walk 1500 miles through Finland. From the islands of the Baltic to the Arctic coast, this work of travel literature looks at the Finnish people through their connection to the natural world. Notes for the Aurora Society is the story of a 1500-mile walk through Finland. Leaving from the southernmost point of Finland, the author crossed the Finnish countryside interviewing Finns about their relationship to nature and exploring the land and the history that made modern Finland. His journey deposited him, five-months later, on the shores of the Arctic Ocean. 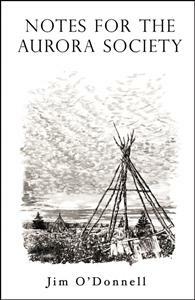 Blending a naturalist’s ecosystem knowledge with an anthropologist’s ability to elicit unique insight into the process of culture, this work of travel literature is the first book to look at the Finnish people through their connection to the natural world. Whenever I pick up a book of nonfiction, I need to know whether or not I trust the writer--if I trust him to tell me of the world as it is, rather than as how he wishes it to be. I loved this book precisely because I could follow O'Donnell on his journey to a place I've never visited and trust him completely to show me Finland as he truly experienced it. The bonus is that I learned as much about how we North Americans perceive the natural world as I did about Finland.